So I’m working on a schedule to avoid disruptions like this in the future, maybe I’ll write the posts at night, maybe on the weekends, or maybe just really, really early in the mornings. But they will get done. It started innocently enough. 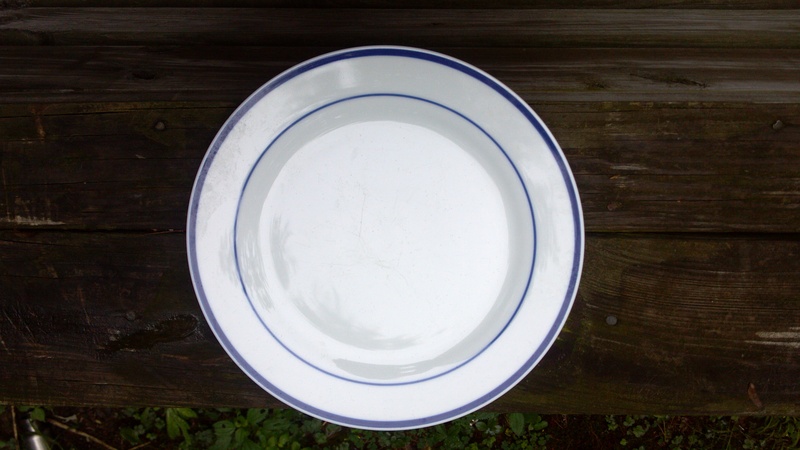 I shared a photo on my facebook page of how dinner plate size has increased in the US over the years from 9 inches in 1950 to up to 12 inches in 2012. It thought it was an interesting statistic. Then one of my friends told me, that if I thought that was interesting I should read “Mindless Eating” which then led me to a book called “The 9 inch “Diet”” which blew me away. You know those funny pictures that can either be a rabbit or an old man depending on how you look at it, but once you see the rabbit you can never undo seeing the rabbit? That’s how I felt when I read “The 9 inch “Diet”” Over the years I’ve been so careful to teach my kids portion control, it’s a huge part of how I control our food budget and how I try to keep them healthy. Then along came the portion plate guidelines that made it even easier for us. 1/2 of the plate should be vegetables, ¼ carbs, and the last ¼ of the plate should be protein. Sounds pretty good until you realize that when you are using HUGE plates, ¼ of that plate is a lot of food (even though you think you are eating within guidelines.) This explains so much. It explains why people can never seem to lose weight even when they are following healthy eating standards. It also explains why my kids put on weight once they go off to college (well that and the late night pizzas) Many colleges dispense with dishes all together and just use trays. It’s a losing battle to maintain or lose weight when you are serving meals on plates the size of Nebraska. 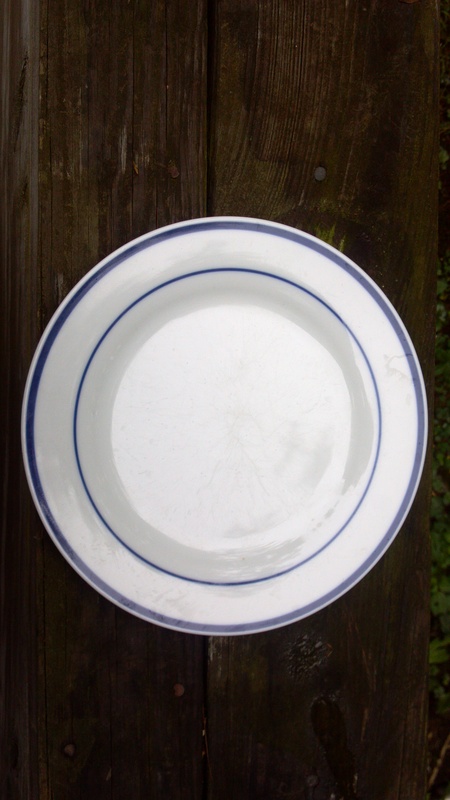 This is our ex-standard dinner plate. It measures 11 inches across. This is our new dinner plate. It measures 9 inches across. This is our old plate with our new plate. See the difference? Yup, that’s how much Americans have increased our plate size over the years. Pretty disturbing isn’t it? It’s important to note that I’m not expecting the kids to lose weight, all of them are at a healthy weight. I will be interested to see if Marc and I lose weight (because both of us are not at the ideal healthy weight.) There will be no restrictions on food, if anyone want seconds or even thirds have at it, it’s just that they all have to use our new 9 inch plates to put those helpings on. DInner: use that 9 inch plate and no repeats. A good walk helps too but I confess just keeping that regime above on food intake has helped me shed some pounds. I remember a couple of years ago, some friends of ours from Switzerland were visiting and we picked them up at the airport and went to the North End for lunch. When we were served they looked shockingly at each other and then one of them remembered and said, “Oh, that’s right, we are in the US now.” That has always stuck with me as a reminder of American overeating. Good luck, Flock, and after a few weeks, eating on a larger plate will seem obscene. We lived in Germany for the academic year 2004-05, and picked up some household items from a family that was returning to the States, including their dinnerware. When I unpacked I showed my husband the dishes, and asked him why we had so many salad plates, but only one dinner plate? Yep, what we took for a dinner plate was their serving plate, and the salad plates were dinner plates. 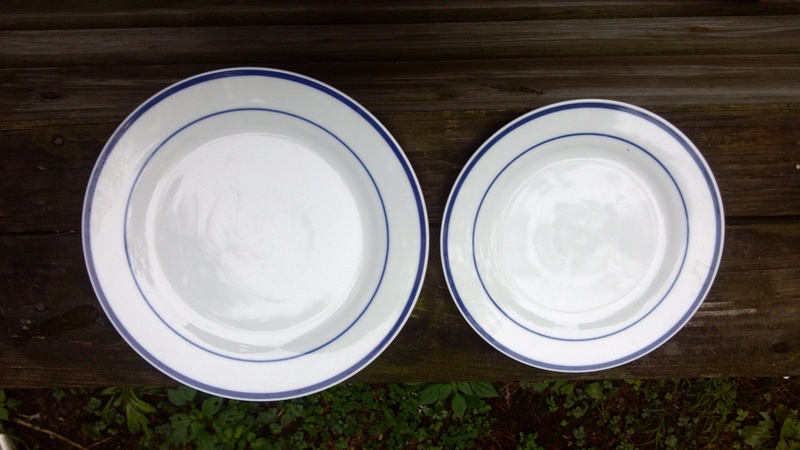 Time to start with the smaller dinner plates…. It definitely is a mind set. We are getting used to our smaller plates and once we took the larger ones away, we now see our 9 inch plates as the new normal.